Fireworks displays, with their furious fusillades and powerful vibrations, have long been an accepted part of 4th of July celebrations. The crackling sounds and dazzling lights, sometimes set to patriotic music, wow the young and young-at-heart alike. But 4th of July fireworks also serve as a vivid reminder of the brutal gunfire which made this country free. And at a time when senseless killings lead to calls for an outright ban on guns, it is easy to forget that our rights were ultimately secured by a citizen army largely equipped with personal weapons. Many of the weapons used during the Revolution are on display in museums today, or in the vaults of private collectors. Some examples of these aging weapons are unique, while many more might be considered carefully crafted works of art. 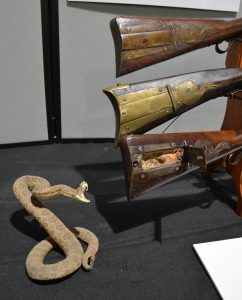 Every spring, the Maryland Arms Collectors Association hosts an internationally anticipated event simply known in the antique arms realm as “The Baltimore Show.” Considered to be the premier antique arms event of its kind, the Baltimore Antique Arms Show boasts over 1,000 tables of the finest in collectible rifles, revolvers (pre-1898) and sporting shotguns. 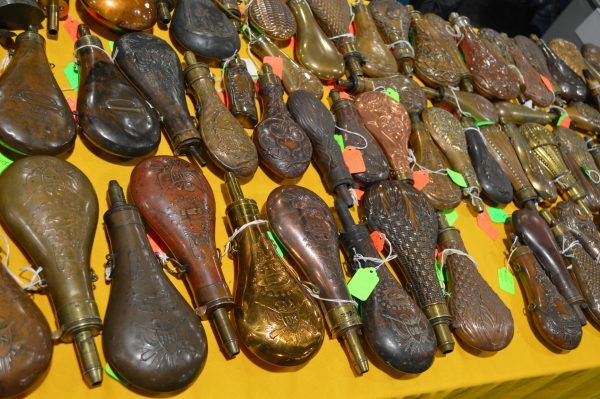 The Baltimore Show attracts thousands of serious collectors from across the globe. It is truly the “must attend” event of the gun collector year. We attended this year’s show back in March, just before embarking on an unrelated month-long assignment. 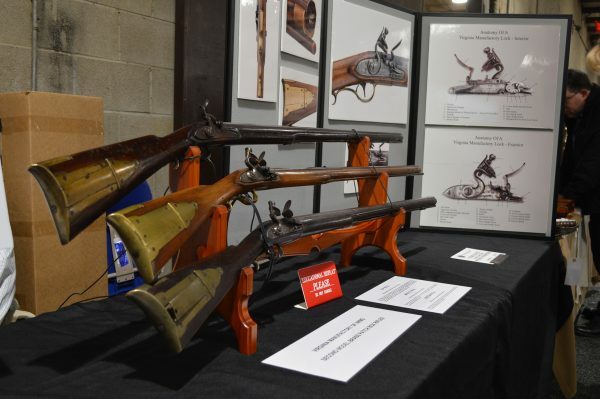 The Baltimore Antique Arms Show was held at the Maryland State Fairgrounds in Timonium. 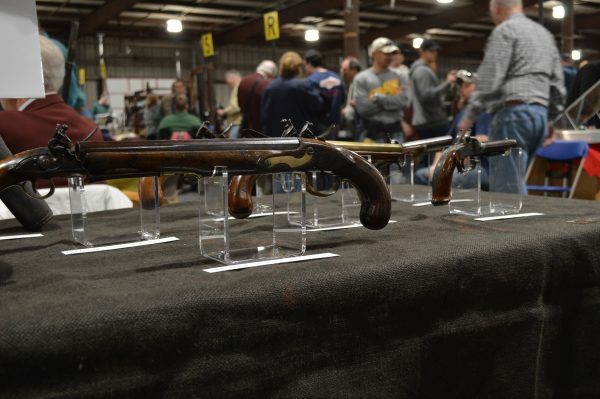 Craig Bell brought an assortment of flintlocks with a fascinating history. “These are Virginia Manufactory Arms, which was the first state-owned armory after the American Revolution. For me what is cool about these rifles is I live about two blocks from the site where they were made. “Virginia said they wanted to take care of arming their own troops, so it was started in 1798 with the first production happening in 1802. They produced muskets, swords, rifles, and bayonets. What I brought here today are examples of the types of rifles they made. They made two styles. One is called the Rattlesnake because the patch box is coiled with a rattlesnake that says, ‘Don’t Turn On Me.’ When you see the flags that say ‘Don’t Turn On Me’, well, this came first. This weapon came after the Gadsden Flag, around 1806 – 1809. Only eight of these brass-styled rifles have survived. These are three of the five which remain in private hands. They made some changes in the second model, but total production of the pair was 2,093. Courtney Wilson, Executive Director of the B&O Railroad Museum, is also an avid collector of antique arms. “As a young man who grew up in the middle of the Civil War Centennial in the 1960s, my dad took me to every Civil War reenactment and battlefield on the east coast. I fell in love with American History; with military firearms and culture. Midwest collector Perry Hansen said he started out collecting powder-class weapons when he was young – mostly because they were affordable. But from there, he went to patent-infringement weapons. “In the gun industry, the Rollin White patent, for a bored-through cylinder that accepted a cartridge, was purchased by Smith & Wesson. What Smith & Wesson did was hold the patent during the Civil War. They would not release the patent to Colt or other firms that had government contracts. That’s why the army still used the cap and ball during the Civil War. The antique arms displays were not limited to the collections of esoteric investors. We also spoke with author/collector Dan Hartzler and private museum curator Rodney Brown. 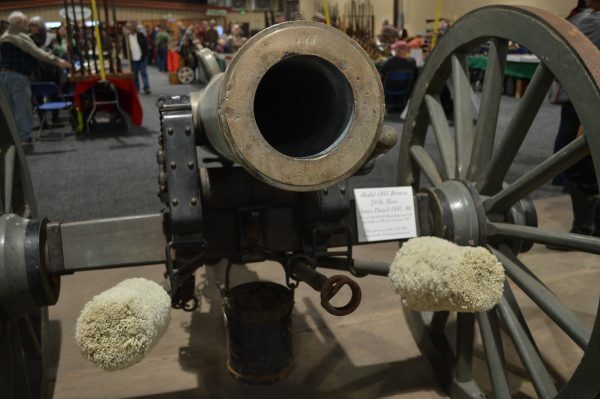 “I collect anything made in Maryland or carried by a Marylander,” said Hartzler, “from Kentucky rifles to Civil War to War of 1812 and the Revolutionary War. I also collect clocks, swords, bayonets, etc. I’ve written 20 books, and they are all on Maryland subjects. “The collection I have on display today are all pistols that were made by Maryland armorers. They date from the French and Indian War of the 1750s to the Revolution and War of 1812. These were all made by Robert Hazlett, who was a wonderful gunsmith here in Baltimore. He used silver and gold on his guns. “I have a private museum known as the War Museum,” explained Brown. “The museum is refocusing its collection away from WWII and more to the Age of Exploration, Columbus, and the Caribbean. So I’m de-assessing a lot of cases, and that is what you’re seeing here on display this weekend. Half of the stuff has been on display in other public museums. “One very interesting piece is this Hungarian parade shield, made of enameled steel on wood with inlaid turquoise. It is an art object! I collect things because of the history attached to them – not some generic military value. Everything I collect is a unique piece of history, with that history attached. We asked Brown why he was refocusing this collection on the Age of Exploration? A special moment at this year’s event was the presentation of an award to a set of pistols which once belonged to George Washington. 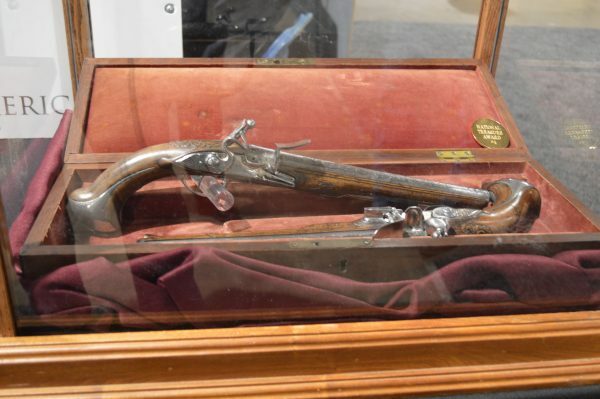 The matching flintlock saddle guns are currently part of the Washington Collection at the Fort Ligonier Museum in Ligonier, PA.
Philip Schreier, of the NRA’s National Firearms Museum, was on hand for the presentation. Schreier has been the official liaison to the Baltimore Show for almost thirty years. Schreier said the NRA has over five million members, but they don’t self-identify as collectors, even if they have a collection of historic guns. “Members will hedge if you ask them, but let’s face it – if you see something you like and you bring it home, then you’re a collector. Turning back to the importance of guns in American history, we asked Schreier if he would address the pressure many antique arms collectors encounter today as we sit at our present cultural crossroad. “This just tells you that our freedom wasn’t purchased with good words, deeds, thoughts, and cornstalks. 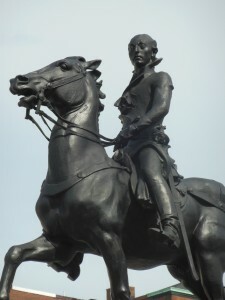 It took Brown Besses at Lexington and Minuteman safety muskets at Concord. And it took squirrel rifles at Bunker Hill to help purchase the independence we achieved at Yorktown in 1781. We’ve maintained and defended that freedom ever since with firearms. “The American process of industrialization began in New England making guns. “When the Japanese signed the articles of surrender on the battleship Missouri in 1945, there wasn’t an American soldier anywhere who wasn’t carrying a weapon marked ‘Made in the USA.’ We not only supplied our soldiers, but we supplied the soldiers of our allies, in order to beat Fascism. “Everything we have today, from washing machines to I-phones, goes back to putting those revolvers in the hands of Texas Rangers. 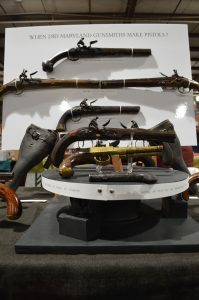 For more information about the Maryland Arms Collectors Association and future dates for the Baltimore Antique Arms Show, visit The Baltimore Show. ← Reader asks: Why are Republicans still supporting Trump?